Paradise Inn (main entrance), Mount Rainier NP, 1985. Paradise Inn is a two-and-one-half-story structure of log frame construction built during 1916 and 1917 in the sub-alpine region of Paradise Valley on the slopes of Mount Rainier. The main building is generally T-shaped in plan with an annex constructed in 1920 running parallel to the main building and connected to it by a multi-story enclosed bridge. The foundation is rubble masonry with a cement mortar. The original building consisted of the main portion containing the lobby, with dining-room and kitchen wings to the north. Guestrooms were on the second floor above the dining room. A three-story wing on the building's east side contained additional guestrooms, baths, and suites. The annex was constructed in 1920 to provide additional guestrooms. The mezzanine level was added to the lobby in 1925. About 1935 the original kitchen wing was demolished and replaced with a new, larger one. At the same time the porch off the rear of the lobby was enclosed and turned into a gift shop. 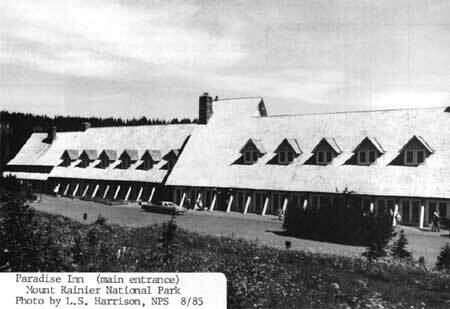 The failing concessions company--Rainier National Park Company--sold the Paradise Inn to the National Park Service in 1952. The park service continued operating the structure on its normal seasonal basis through a concessions lease. In 1962 the new lessee added an employee cafeteria to the kitchen. The building underwent a major rehabilitation in 1980 when a new sprinkler system was installed and the structural system was improved. At an unknown date the log trim was partially removed from around the doors and windows. In recent years the concessioner added the rustic staircase with its log balustrade adjacent to the lobby. Today the Inn retains considerable original fabric and considerable integrity. The most dominant characteristic of the building is the series of massive gable roofs that make up more than two-thirds the height of the building's main wing. The highest sections of gable roof cover the lobby and registration areas, giving it an obvious architectural emphasis. The dining-room and kitchen wings to the north are set back from this main section and thus recede both visually and psychologically from the front elevation. On the front elevation the main gables are pierced by dormers. Less dramatic dormers and shed-roof dormers on the rear of the Inn and on the annex contribute to that rhythm of broken roof expanses. The shed-roof dormers replace the original gable dormers destroyed by heavy snows. Cedar shingles sheath all of the roofs. The front elevation of the Inn contains a series of fourteen bays with glazed, multi-light panels that can be opened during fair weather. Structural log-and-steel inclined columns separate the bays. These structural members replace the original log bracing at the same locations, but they extend from the eaves at a more pronounced angle than the original. Each inclined column has a steel T-beam core that is wrapped with a hollowed log to hide the true structure. The fourteen bays of equal size downplay the location of the principal entrance. A terrace bordered by a log railing is at the south end of the structure. The original stone chimney extends up this south gable end. The structure's timber framing is exposed on this gable end, infilled with exterior wall sections of wood shingles. The east wing extension of the original structure has a roofline lower than that of the main wing. The entire east wing of the Inn is banked into the hillside. The change in slope is reflected in the angle of the enclosed three-story breezeway attaching the east wing to the 1920 annex. The simple architecture of both of the east wing and the annex is utilitarian in nature. The exteriors have the sane shingle siding and shingle roofs. All of the steeply pitched gable roofs have the basic roof forms broken again and again by intersecting gables and dormers that add texture to the architectural mass by the play of light and shadow. Windows in the Inn and annex vary from six-over-six double hung windows to nine-light casements. The dining room windows on the east and west elevations are twenty-four light fixed sashes. The natural light adds a warm glow to the interior public spaces. Undoubtedly the building's most impressive space is the lobby. The Alaska cedar logs making up the structural framework are exposed throughout. The steepness of the roof pitch and the repetition of the structural framework are the basis for the building's character. The cedar logs have a natural silvery finish to them, caused by the weathering and eventual loss of the bark, and subsequent aging as the trees remained standing years after a forest fire. The structural system of posts, beans, and trusses is augmented by a system of cables, and iron rungs wrapped around the first-floor structural posts to keep them from checking under the heavy snow loads. The lobby has a parquet floor (non-historic but compatible) and wall finishes of beaded siding and painted fiberboard. The second-story dormers allow natural light into the lobby. The mezzanine constructed around the edges of the lobby's second story has log railings and wood floors as well as fine architectural and spatial vistas for experiencing the "forested" lobby. The original Japanese lanterns that lit the lobby were replaced by lights with parchment shades painted with designs of local flora, probably during the Inn's early decades. The registration desk, entrance to the bar, and the post office area with half-log panelling and log Alpine detailing add a considerable amount to the building' s character. Built-in benches are peeled logs. Staircases have log newel posts and railings. Enormous stone fireplaces add definition to the north and south ends of the room. The east wall of the lobby, originally an outdoor porch, now houses the enclosed gift shop and snack bar. Both of these rooms contain no historic fabric of note. The registration desk at the north end of the east wall is original. In the dining-room the first-floor structural system is exposed as it is in the lobby. The posts are each wrapped with cable directly below the notches where the diagonal bracing rests. This added precaution was again to keep the posts from checking and then splitting under the compression of the snow. The chandeliers are made of three small logs shaped into triangles with wrought-iron detailing. The parquet floor (again non-historic) is similar to that in the lobby. The walls have a wainscotting of dark wood panelling with plaster finishes on the remaining walls and ceiling. A stone fireplace and chimney at the north end of the dining room add a warm, homey feeling to the space. The posts of the dining room are painted in Swiss floral designs, while those of the lobby have evergreen-type patterns. These designs probably date from the early decades of the Inn. The cashier's counter is of the same log construction as the registration desk in the lobby. Several important pieces of original rustic furniture remain on the first floor of the lobby and are included in this nomination. The hand-crafted grandfather clock, piano, benches, and tables constructed of enormous logs possess the fine character of having been constructed by a creative wood crafter. Other pieces of furniture, although manufactured, date from the early days of the Inn. These include the rustic and colonial style tables and chairs on the mezzanine and the colonial style dining room furniture. The guest-rooms of the Inn are small and not particularly distinctive, although the battens over the panelling in the guest-rooms, the exposed logs where they occur, the original bathroom fixtures, and the brown baseboards and moldings provide some character. The interior of the annex contains no fine architectural detailing. Only the exterior of the annex is included in this nomination. Paradise Inn's architectural significance lies in its use of local materials that create a dramatic exterior image and unusual interior spaces. The Inn falls into the same category as other rustic park hotels, such as Yellowstone Park's Old Faithful Inn, that each served as experiments in finding a solution to the design problem of hotel architecture appropriate to national park settings. The awesome landscape of many of these park settings required new types of architecture, where forms and materials related not to other man-made structures as they would in the urban environment, but to the natural structures of the surrounding landscape. One unique aspect of the Inn is the architect's use of naturally weathered timbers weathered, left standing and exposed to the elements for thirty years before being cut for use in this building. The long period of weathering allowed the Alaska cedar to develop an unusual silver sheen. On a regional level of significance, Paradise Inn is one of the oldest high-elevation mountain resorts in the Pacific northwest, and one of the earliest ski resorts in the nation. The Inn housed many of the competitors for the 1934-35 Olympic tryouts held at Paradise. Over its 70 years of seasonal occupation, the Inn has housed various movie stars and dignitaries including Sonja Henie, Shirley Temple, Tyrone Power, Frances Farmer, Cecil B. DeMille, the crown prince of Norway, and President Harry Truman. The Paradise Inn was the first major concession structure built by the Rainier National Park Company. National Park Service Director Stephen T. Mather approached a group of businessmen from Seattle and Tacoma and encouraged them to form a company to build and run the concession operation at Mount Rainier. Mather sought more unity and higher quality design in visitor facilities, and felt those goals could be accomplished by consolidated concession operations in individual national parks. In addition he was concerned about controlling public use in the fragile, subalpine meadow at Paradise. Paradise had been a popular camping area for climbers and day-hikers since the nineteenth century; but the early haphazard development of the tent hotels did not present the image of a well-managed national park, which Mather perceived as a significant problem for his newly-formed bureau to tackle. Mather explained to the northwest businessmen that the only alternative to a concessions operation formed locally, was to allow business interests from the east to form the company and run it--an idea that they did not accept. Mather worked hard at organizing and supporting developments by private interests. By providing comfortable accommodations and reliable services for visitors, the numbers of tourists would increase. By increasing those numbers Mather could gain popular support for the few existing national parks and also the areas proposed for park status. Popular support, of course, meant additional funding for appropriate development, but more importantly it meant funding for acquisition of areas worthy of preservation in perpetuity. In 1916 the local businessmen formed the Rainier National Park Company and financed construction of the Paradise Inn. Members of the Company made a hasty decision on the location of their new hotel at Paradise. They hiked from the end of the 1916 automobile road at lower Paradise up to the present site. From there they could see the summit of Mount Rainier, the Paradise valley, and the Tatoosh range in the distance, so they decided to construct the Inn on that location. The grassy slopes of the subalpine meadows and the low rise of the vegetation provided a picturesque setting for the new hotel. The Company hired the Tacoma architectural firm of Heath, Grove, and Bell to design the structure as the central architectural feature of a consolidated development that eventually included "bungalow" tents, a ski lift, and a guide house. The bungalow tents proved unpopular with the guests, who preferred the comforts of the Inn, so the company constructed the Annex to the Inn and eventually demolished the tent frames. The architects chose native materials for the Inn structure. The stone for the foundation was quarried locally. The logs for the structure were hauled from a nearby (now non-existent) area known as the "silver forest" on the slopes of Mount Rainier. A fire on that western slope in 1885 left standing timber of dead Alaska cedar trees that had weathered over the years as the bark and branches fell off. The exposed wood turned a glossy-silver color. In 1916 the logs were hauled to Paradise to build the Inn. The use of the logs that had weathered for 30 years as the structural framework exposed on the interior of the building was unique in concessions architecture in national parks. The building's form and materials tied it visually to the landscape. The main wing of the Inn was sheltered by a multi story gable roof that dwarfed the ground floor. The steeply pitched roof that was covered with green-painted wood shingles mimicked the shapes of the rugged Tatoosh Mountains in the distance, and the summer color of the surrounding subalpine meadow. The exterior walls were sheathed with wood shingles that weathered grey over the years, like the silvery timbers on the interior The woodwork, particularly the detailing of the lobby registration area, the post office, and the handmade furniture was completed by a German carpenter Hans Fraehnke during the winter of 1916-17. The piano, the grandfather clock, and the detailing around the registration desk, were designed with a gothicism reminiscent of woodwork from the Bavarian alps. The piano--played by President Harry Truman during his visit--was detailed with heavy log cornerposts of peeled logs with pointed, whittled ends. The grandfather clock's carefully whittled quoins at its base, spiked and whittled cornerposts, and capping of a broken pediment and whittled finial, added elements that were simple and primitive in their material, but refined in their creative execution. These unusual pieces gave the interior decor a strong alpine feeling, with a hint of German gothicism. The continuous use of Paradise Inn over seventy years, and the' periodic updating of the guest facilities have not marred the integrity of the building and its most significance architectural spaces--the lobby and the dining room. The Inn's rustic character presents the rugged, but controlled image Director Stephen Mather sought. 1 Information on this master woodcrafter is lacking, other than his name. German mastercraftsmen appear with amazing frequency in folklore of western national parks, with usually little documentation other than oral tradition. The story most often connected with the craftsman--often a stone mason but sometimes a woodworker--is that he was very poor and was passing through the area with his family. He took on the job because he needed the money, completed the work entirely on his own, left the respective park, and was never heard from again. 2 A detailed history of the Paradise Inn has never been completed which is unusual considering the building's age, significance, and the romantic attachment afforded this structure by the residents of the Pacific Northwest. Information on the master carpenter and the architectural firm who worked on this building have not been documented yet in detail and need to be, so that the fabric and intent can be better understood. This type of detailed research was, unfortunately, beyond the scope of this project. Eastman, Leslie W., M.A.I.. Appraisal of Rainier National Park Company and Inventory Mt. Rainier National Park, Washington. Submitted to the National Park Service, February 15, 1951. McMillon, Bill. Old Lodges and Hotels of our National Parks. South Bend: Icarus Press, 1983. National Park Service, Pacific Northwest Regional Office files including inventory and National Register files. Snow, David E. Historic Structure Report: Paradise Inn, Mount Rainier National Park, Washington. Denver: National Park Service, 1979. Thompson, Erwin N. Mount Rainier National Park, Washington: Historic Resource Study. Denver: National Park Service, 1981. The boundary is a rectangle measuring 285' x 255' encompassing the Inn and Annex. The boundary line begins at a point 33.5' west of the western corner of the Inn (noe that the point is also 15' west of the corner of the new outside deck), and it proceeds northeast 285' running parallel to the lobby walls, then 255' southeast, then 285' southwest, then 255' northwest to the starting point.